Ben Gladwin signed from non-league Marlow in the summer of 2013. 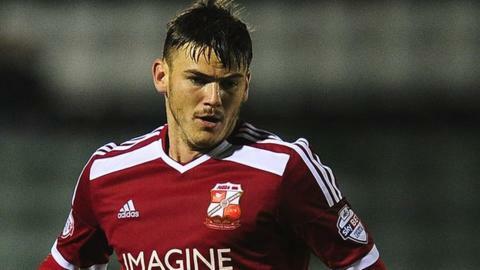 Swindon Town midfielder Ben Gladwin is set to undergo knee surgery on Monday which is likely to keep him sidelined for four weeks. The 22-year-old sat out Town's last game, a 3-1 victory over Chesterfield on 17 January. And he did not travel to Tenerife for the team's warm-weather training, which was arranged following the postponement of Saturday's game against Bradford. The League One leaders return to action against Sheffield United on 31 January. Gladwin signed a new contract with Mark Cooper's side last month and has made 21 appearances this season, scoring twice.